A Case Study in Cracker Barrel: Rewriting the Rules for Social Media Moderation? Originally published March 25th, 2017 for an assignment blog. Having a presence on social media (SM) can appear to be a necessity. If your target audience is searching for you and you're not there, chances are your competitors are going to be the ones popping up in your place. With this in mind, a business may seem to dive headfirst into SM, using only the experience they have had with their own personal pages. Most of the time if you just use common sense, there really isn't any harm done. If you're the pizza shop around the corner, the boutique clothing store, or maybe the local pub, common sense will go a long way. It's just another way to let your customers know about what's going on. That being said, if you follow a publicly listed restaurant chain with 639 stores in United States, with a revenue of over 2.58 billion, you would have certain expectations for how they would act on social media. Firstly, you would probably assume they know a lot more about SM than you do. So when we see a large organisation do something we wouldn't, we are all pretty quick to judge. It is easy to point the finger and say "You're doing it wrong. ", watch the fallout from their decisions and say "I could've done better" - especially if you manage/moderate social media for work. The emergence of Web 2.0 has seen opinions like these come out in full force. Not only are we saying we would've done it differently, but we make sure to let them know how badly they screwed up. There is no more one way communication, everything done on SM is two way. From the things you post, to the things you do, your stakeholders will be able to add their opinion to the view of others. An innocent post about pancakes. What could go wrong? Well, the post received over 19,000 comments. And after reading over a thousand of them, I was having trouble finding a post that had anything to do with pancakes. Even the recipe posted for 'Mixed Berry Pancakes' require the tears of Brad's wife as an ingredient. Screenshot from Cracker Barrel's Facebook. Screen shot of Cracker Barrel's Instagram. First impressions is that Cracker Barrel has shown exactly what not to do when dealing with a potential crisis that can spiral out of control. But we need to still remember that SM is still incredibly young relative to traditional communication channels. Facebook and Twitter have both only been open to the public for a little over 10 years. Instagram, launched in 2010, making it less than a decade old. The young age of SM makes it the wild west of communications. There are countless academic journals, how to books for utilising SM, and theories that try to portray an understanding of the platform but these theories and guides are changing all the time. Even professionals don't have it completely figured out. However, it would be remiss to think that Cracker Barrel have abandoned strategy all together. Only they know if this crisis has even affected their sales or bottom line, and it is yet to be seen if this whole fiasco has even affected their stock price. The strategy of silence is a new one in the online space. However it seems Cracker Barrel is intent on waiting it out, not providing a single acknowledgement to the crisis at all. Regardless, this crisis is going to provide a great case study depending on the outcome. Will it show that huge viral crises can potentially have no negative affect to the actual business? Is the online crusading for Brad's wife just Kony 2012 levels of slacktivism? A company this large not even issuing a corporate statement due to a SM crisis is unprecedented. Has Cracker Barrel rewritten the book for social media crisis communications? 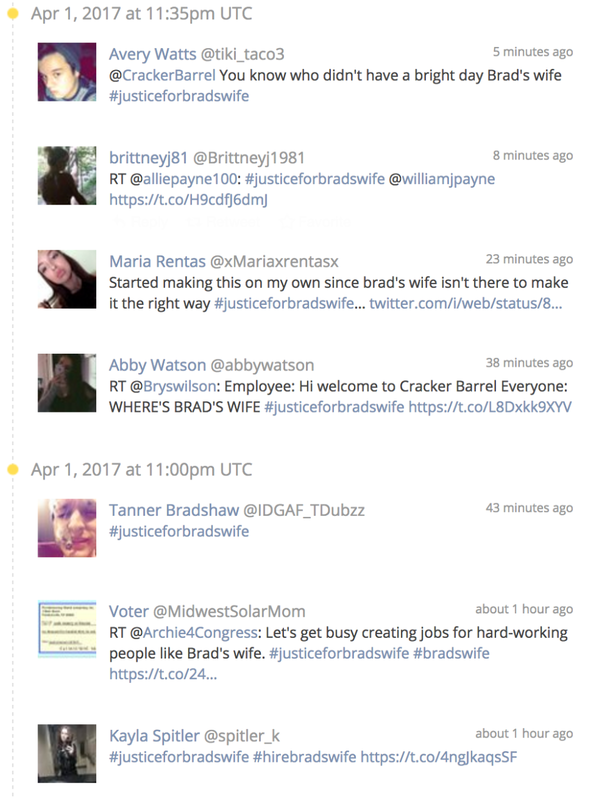 Update May 27th, 2017: Cracker Barrel have still not responded and their content is still being hijacked with Brad's wife comments. Update August 23rd, 2017: Brad's wife comments are actually dying down with some users even telling others to "get over it". Very interested in how this is going to play out.